The above combination of vegetables and fruits are what we call the 9-gems. First boil all the vegetables in a pressure cooker till one whistle. Do not over boil them. Take 1 tbsp ghee and slightly fry the dry fruits for about 1 min on medium flame. Do the same for the paneer cube. Keep them aside for later on cooking. In the same pan, add the remaining cooking oil and heat it well. Now add the onion paste and fry till slightly brown. Add ginger, garlic and fry for one minute. Add salt, and all the dry spices (including, turmeric powder, red chilly powder, gram masala, coriander, cumin, powder) and fry for 2-3 minutes. 1 cup of warm water may be added to this masala and mix well. Now, add tomato puree and fry for another few minutes till the oil separates well from the pan. Add the coconut milk. Bring it to boil. Then keep it in medium flame and cook until the gravy turns thick and smooth. Now add paneer pieces to the gravy and stir well. Then add all the vegetables one by one to the gravy and cook for about 5 minutes. 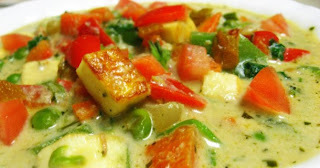 Before turning off the heat, add the cream and decorate Navratan Korma with chopped coriander leaves. Serve with Naan bread or Pulao.